Numerous studies have shown that the mutational analysis of the genes BRAF, NRAS, KRAS, HRAS and of the re-arrangements RET/PTC1, RET/PTC3, PAX8/PPARg can become an effective diagnostic tool used to classify nodules with an undefined cytology. The presence of gene mutations or re-arrangements are a strong indication of malignancy and lead to the surgical removal of the thyroid. 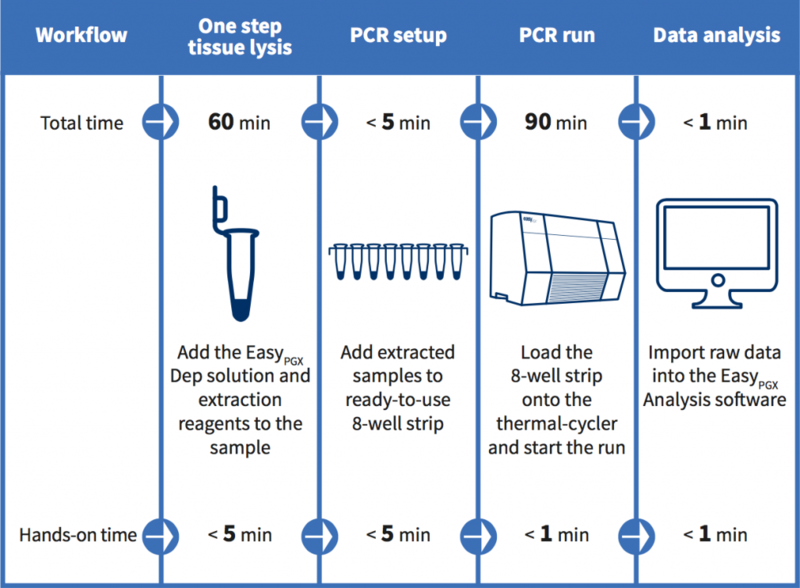 This Real Time Pcr kit, detects somatic mutations of codons 12, 13 and 61 of HRAS, NRAS, KRAS genes and codons 600 and 601 of BRAF gene. This test allow to identify with higher accuracy the nodules that have an indeterminate citology results, aiming to limit surgery to a small minority of cases which harbour malignancy. Thyroid cancer is the most common endocrine malignancy and typically originates in thyroid nodules that have a frequency of 19-68% in the adult population, in particular women. The majority of the thyroid nodules are benign and only a minority of them (5-15%) harbour malignancy. Fine needle aspiration (FNA) cytological analysis is the primary diagnostic intervention to classify benign or malignant nodules. Unfortunately, nodule cytology remains indeterminate in nearly 25% of cases. Patients with indeterminate nodules are commonly referred for consideration of lobectomy or near-total thyroidectomy, however only the 10-40% of resected nodules are confirmed as malignant in subsequent histology. From the clinical point of view, the development of new diagnostics strategies that allow a more accurate classification of indeterminate nodules is crucial for a better estimation of the individual’s thyroid cancer risk in order to reduce the rate of unnecessary surgical procedures and associated complications1,6. Many studies have demonstrated that the mutation analysis of BRAF, NRAS, KRAS and HRAS genes together with the detection of RET/PTC1, RET/PTC3 and PAX8/PPAR? rearrangements can be a valuable diagnostic tool for indeterminate nodules classification. The presence of these mutations or gene rearrangements is strongly correlated with malignancy. BRAF mutations, RET translocations, RAS mutation and PAX8/PPAR? fusions are present in the 45%, 20%, 40% and 35% of papillary thyroid tumors respectively7,8. exclusive in thyroid cancer and PAX8-PPAG fusions do not occur concomitantly with RAS mutations in papillary cancer5. BRAF somatic mutations are present in 40-45% of papillary, 30-40% of anaplastic and 20-30% of poorly differentiated thyroid cancers. The vast majority (98%) of BRAF mutations are V600E, but the K601E mutation has also been reported. NRAS, HRAS and KRAS mutations are present in 6%, 4% and 3% of thyroid cancers. Among the RAS genes, mutations at codon61 are the most common5. nodules: a prospective analysis of 1056 FNA samples. J.Clinical Endocrininol Metab, 96:3390-3397, 2011. 3. Sang Ryung Lee et al. Molecular genotyping of follicular variant of papillary thyroid carcinoma correlates with diagnostic category of fineneedle aspiration cytology: values of RAS mutation testing. Thyroid vol.23, number 11, 2013.